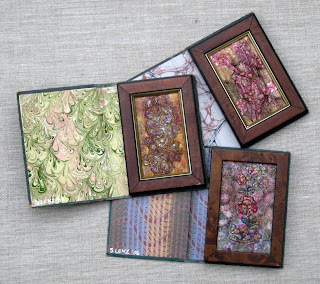 One of the first things I did was to take scraps of fabric and work with them. 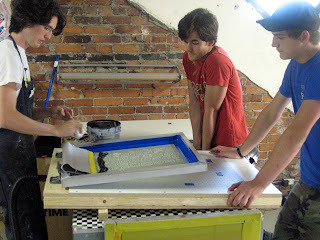 Above was a piece of transfer painted polyester that had been cut off some other project. It was a good "warm up"...trying to see what I could do with something I'd tossed to the side. Another book that has really been helpful in triggering ideas is Dale Rollerson's Surface Tension. Somewhere in it, Dale suggested using "metallic netting" and making a "sandwich". I'm not sure if the image above is doing exactly that...but this is what I did. In fact, I had an entire yard of this gold, lacy stuff and made four piece...two much larger ones...in various colors. Most everything I've read about the embellisher reminds users to work from both sides. At this point, I can safely say that I really like working from the back. Yes, that's me...backwards. 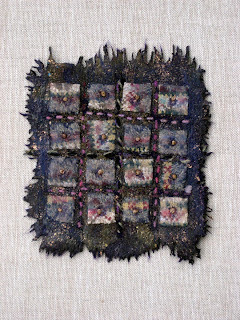 The piece above, however, has a wool yarn worked from the front and little snippets of craft felt worked from the back. At first, this was just another piece of heat transfer painted fabric that I had cut off a section I liked better. Above is just a piece of felt with things worked from both sides. 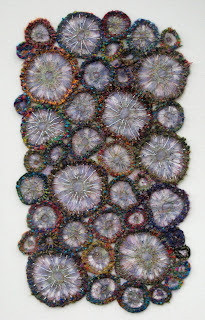 I did several like this...different colors...using snippets of yarn, metallic foiling, wool rovings, chiffon scarves...whatever was close at hand. Fun! 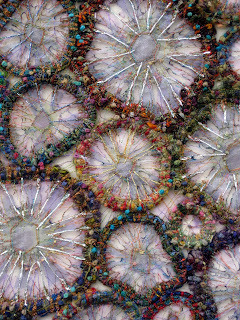 The piece above started off as a wool circle onto which I attached snippets of felt. 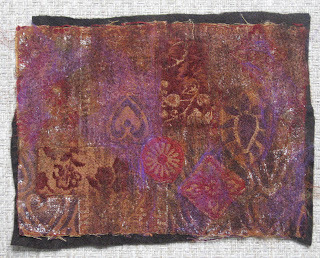 Then I embellished it onto the silk with a piece of red felt behind it. Since I could see the "ghost" of the ornament on the reverse...I worked the red felt onto the front being careful not to get the red on the ornament. I spent a long, long time on this piece. 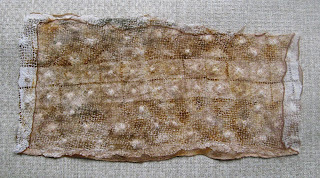 Part of a cotton lace doily was sandwiched with white wool roving between two pieces of tan chiffon scarves. I embellished more wool, in darker tones from the reverse and a bit from the front before zapping the front slightly with a heat gun. 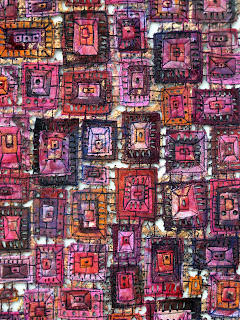 While digging around in the boxes of fabric, I found a little needlepoint from ages ago...back when I did this sort of thing and thought that not following a pattern meant the result was utterly contemporary. It was "finished" but obviously tossed aside...pink isn't my favorite color...so....I thought about an idea I read about on a couple blogs recently...and also in Valerie and Maggie's book...paint it with "emulsion"...house paint and then ink and then bleach. Well...I used the interior latex instead of the oil based exterior stuff and my ink doesn't turn blue and I can't seem to wash out the lingering smell of bleach....but I LIKE IT NOW! I also found another piece of needlepoint...three-quarters completed...intended to become a pillow...based on mosaics..some design out of a book I no longer own. 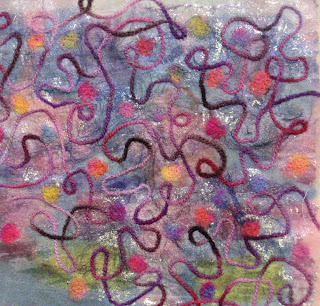 Well, I cut off about a third...the mostly unfinished area...and embellished little snippets of felt into it from the reverse...and tape yarns...and kept going...and added a yarn border...and WOW...I LIKE THIS ONE TOO! I haven't decided what to do with the "finished" part yet! 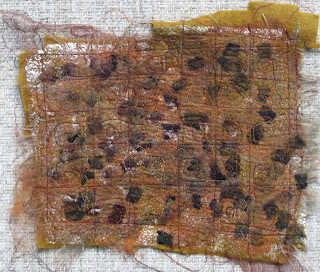 Above is another piece of felt with "things" worked into both sides and then stitched. 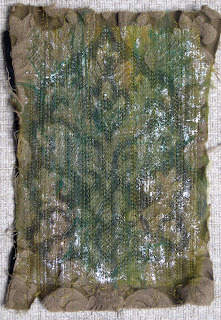 Then, I took a lace piece off an old, polyester (very tacky!) wedding dress I bought in a thrift store (there were a few beads actually glued onto it...terribly tacky). I used brown felt with painted WonderUnder and metallic foil, pale blue and mauve rovings, and a light blue chiffon scarf. Then I stitched with a gold metallic thread. From a previously cheap-looking piece of lace...I think I really succeeded in making something lovely. Then, I went into the upholstery scraps. I cut apart this one piece and resembled it with the embellisher (above). I spent more time with the piece below. Originally, it was a single color. I embellished enough from the front to see the "ghost" of the areas from the reverse. Then, I followed this design in order to "punch" the black felt through to the front...two-toned...covered it with painted WonderUnder, metallic foil, a scrap of a green chiffon scarf and stitched. This machine is amazing. The stack is growing. There are others...these are just my favorites! My Video now have their own place! Steve and Mathias went to Washington, DC for the weekend. There was an antiquarian book auction...making it a "business" trip...but the real reason to go was in order for Mathias to take ballet class with his Kirov Academy teacher/mentor Anatoli Kuckeruk. 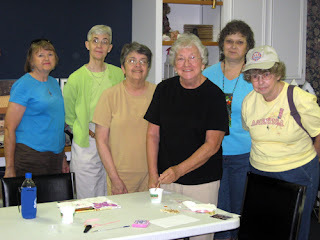 On Friday I went to the "Altered Diva" meeting at Creative Sewing. (Photo above) I had never been to such a gathering and found it rather odd. It seemed to be mostly traditional quilters. 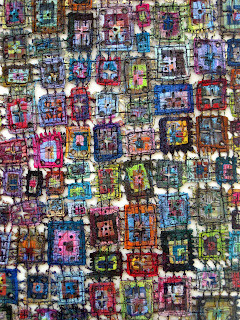 They thought it totally strange that a non-quilter would purchase an embellisher. 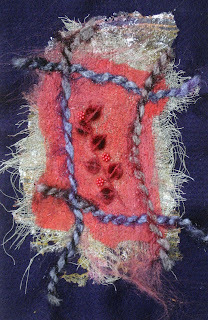 They asked me, the embroiderer, one question, "What's the 'moss' stitch? ", which I didn't know. In truth, I know few very stitches. I know fewer names of stitches. I felt like an idiot, totally intimidated, and out of place. I doubt that I'll return to this group but did enjoy talking to their "leader" Sandra Baker, who is a member of Fringe Sisters...a closed group of quilters working in some non-traditional ways. http://www.fringesisters.com/ I've enjoyed the work produced by this talented bunch of ladies. Nick and Sara recently graduated from the University of South Carolina with degrees in art. They had enough guts to open a business and have done some great work. I especially liked their Indie Grits Film Festival poster and the two skateboards they contributed to the charity event that I sponsored at Gallery 80808. I noticed their business cards...screen printed, of course...and their flier advertising classes. The structure and price of these classes can't last for long. Currently they are offering three sessions of three classes (6 - 9 PM for three consecutive weeks) for a mere $100...including all supplies and editions of 10 - 20 prints. Class sizes are 2 to 4 people only. Of course, I signed up Alex, Mathias, and myself. We started this evening. It was great! I've included images below of the last piece for my solo exhibition at Francis Marion University. This is In Box XXXVIII. I sent off the exhibition list and arranged a precise time for delivery of the work. 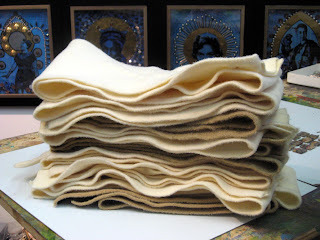 In my studio, I've begun my month long odyssey to create stacks of "complete cloth" and think about a new series. Above is the link to the rest of the "Black God" series. I've finished all of them...I've finished the last piece for the solo exhibition at Francis Marion University. Hopefully, I'll have the photos soon. I also finished Harry Potter and the Deathly Hallows I don't generally read much fiction...it consumes me. My mind cannot freely function when in the midst of a good story. 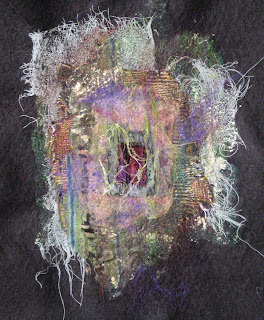 Everything becomes difficult, work, sleep, even embroidery; my head is in the book. Thus, I had to finish this one...even if it did take until 2:30 AM. Now, with everything done, I can begin my month long exploration of creating "back grounds"..."complex clothes" while thinking about a new series. The weekend began late on Friday night at Happy Booksellers. The "party" was well underway when we arrived, and we didn't participate in any of the contests or games. 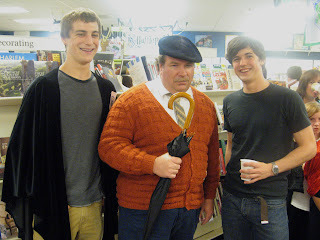 But, the boys posed with the "costume winner"...who really could have doubled for Uncle Vernon! We had three copies of Harry Potter and the Deathly Hallows reserved, not four. Alex will have to finish A Lesson Before Dying, his required summer reading, before tackling the nearly 800 pages by J. K. Rowlings. Meanwhile, I finished stitching the pieces in the "Black God" series and will have them posted soon. 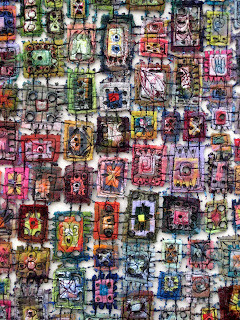 Another WONDERFUL thing arrived in the "email"...a piece I created about two years ago and submitted to an artist book juried show was selected for possible publication in an upcoming book by Lark! 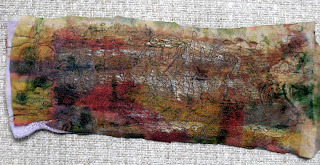 Amazingly, I was actually not selected for the juried show at the time but the slide was saved! I have a bunch of paperwork to complete but am quite excited. During the day, I continued to bead more pieces in the "Black God" series. Around 3 PM a committee looking for original art for the Halsey Institute (a new hospital being built in Charleston) came to look at the "Strata" and "In Box" series. I had submitted a CD of images, resume, and contact information last month. It was thrilling to know that I made it through the first "cut" and that the committee wanted to see my work in person. They asked several questions and one was taking notes. I think the "studio visit" went very well...I'm hopeful but wisely not expectant. Mathias is on his way home! Mathias is on his way back from England! He'll be arriving this afternoon. We can't wait to see him. He can't wait to have lunch at Subway, having his brother, the sandwich artist, prepare a feast. I'm still working on the last "In Box" for my solo exhibition. It's strange how I've seemingly delayed the finish...Am I avoiding "the end"? Am I afraid to step back and view the work...critique it...wonder what else I ought to do...or should have done? Maybe. I'll have to think about this. What is "scary" is often an opportunity. In the meantime, I finished two little altered books. One of these three I did last year. Now I've got a set. The next fifteen of so in the "Black God" series is also done...but there's still more to go...I'll post these later. My mother used to tell my sisters and I that the most important lesson she learned in college was "how to budget time and money". Even as a high-schooler, I understood what she meant...but I didn't really learn the lesson until I, too, went to Ohio State. Years later, I found myself saying this same thing (and, shockingly, many other good pieces of advice) to Mathias and Alex. 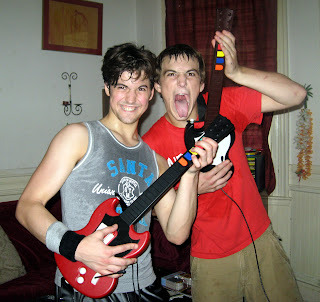 Of course, Mathias instantly understood. He took to "discipline" like a fish to water. Alex, however, has always struggled with both "time" and "money". He's learning though. The job at Subway has been a very good thing. The strange thing is...I'm still learning this lesson. Many little things over the past week have reminded me that "time", "money", and "art" require a delicate balance...a "budget". It's hard. The answers aren't always obvious; life requires constant adjustments. One must often revisit a lesson. For example, a lady came to Vista Studios. She admired the "In Box" on display and we started to talk about the process. We talked. Then, I gave her a business card and told her that I had posted a "how-to-make-an-In-Box" on my blog. She was thrilled and left. Another artist, however, had overhead the conversation and asked me why I'd publicly explain my techniques...why I'd spent time telling others how to do what I do. I laughed it off, of course; but, it got me thinking. I knew why I chose to spend my time writing that post. The answer was easy. It was my intention to share with others because others had shared so generously with me. In a very short time, the Internet can spill hundreds of inspirational ideas at the click of a few button. I've felt indebted to so many blog writers. By writing my "how-to" post, I was "paying back" and "saying THANK YOU". "Thank You" got me thinking some more. My mother insisted that my sisters and I write notes of gratitude...even for gifts we didn't want. It was polite. It was important. It was communication, but I never really "learned" this lesson. I often forget to express simple thanks. So many other blog writers don't forget. I've received dozens and dozens of "thank you" notes..."thank you for visiting my blog and leaving a message". Now, I've got all sorts of messages and haven't written a single word in reply. So....THANK YOU TO : Arlee, Nikki, Purple Missus, Alis, Stef, Anna, Doris, Kate, Maggie S, Micki, Corrine and Lizbeth (Altered Books Yahoo Group), Carol, Sue B, and my sister Wanda. In fact, thank you to everyone who's ever left a comment on my blog. I know I don't reply the way I should...the way I'd like to...the way I feel about comments....I'm a mess. I'll have to work on this childhood lesson! The most important THANK YOU, however, goes to Jacqueline. I admire her work greatly. It is incredible. Like me, she works, has a family, and is mounting an upcoming exhibition. Like me, she deals with the delicate balance of "time", "money", and "art". It is hard. Her comments and posts have given me so much to think about lately. One comment, in particular, really kept me focused. Jacqueline asked what I planned to do with my new embellisher. It was a very, very good question, a wise way to make me think. I have to admit that I wanted the machine because it seemed like a wonderful new "toy". I didn't even know what an embellisher was...but I wanted one. I saw all the great things created with this mysterious machine...and I wanted it. Sometimes such a plan works out...and this one probably would have worked out...but, it was so much smarter to think about the FUNCTION and MECHANICS and APPROACHES first. In the long run, learning to use the embellisher instead of trying to make some "great masterpiece" would save lots of valuable time. Jacqueline's post reminded me how precious studio time is. 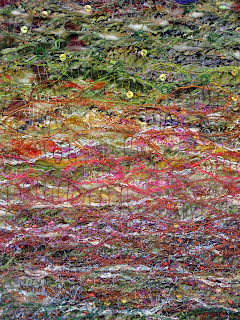 There's never enough time to stitch. I had Dale's book Surface Tension. I read it from cover to cover before touching the machine. I've read it again since then. Thank you Dale! 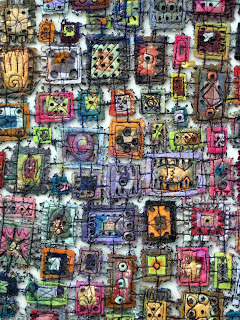 You provided simple exercises for exploration...ways to discover how the machine works and how different yarns, threads, and materials will look. I spent an entire day trying every material in the studio...learning tons of things as I went...learning how to USE the machine. I realized quickly that the embellisher really is a fabulous "toy". It is so much fun...but, since I took the time to experiment quickly and with intention, I'm pretty sure the embellisher will be a WORKING TOOL for me. My "rationalization" for buying the embellisher (or...what I told my husband!) 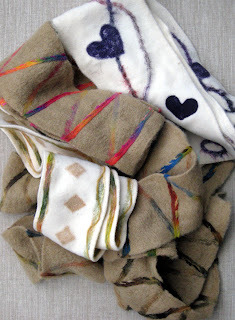 was that I could use the embellisher to create retail merchandise...scarves, purses, pillows, etc. He rolled his eyes, knowingly; I don't generally make anything remotely useful! I claimed that the embellisher would make back its expense in no time. Okay, I've now made a few scarves. I happened to have about a yard and a half of 100% virgin llama material...from some auction, I think...there's a lovely fabric tag on it. I happened to have about a yard of 100% mohair...a remnant from House of Fabrics here in Columbia. I've got a stack of scarves ready to be "embellished" too. 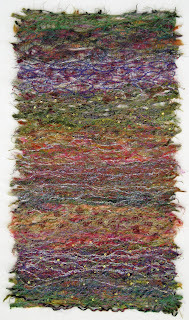 Each has its edge turned under and simply "machine felted" into a finished seam. So far...so good...except, I hate making scarves; they don't inspire me. Another comment from Jacqueline mentioned (paraphrased) "the things you have to do for money". Well, the scarves are one of those things. I will finish them, but it is clear that the embellisher isn't going to be used primarily for "making merchandise". I would need a plan that would really work. Again, Jacqueline's wise words got me thinking. I thought about the South Carolina Artisan Center in Walterboro...where I'm represented. They sold the last bunch of scarves I forced myself to make. They want more. They are also dangerously low on book markers. I had to face that "money" issue. Sure, book markers don't make lots of cash. In fact, after commission and expenses, I net only $2 each....but I sold well over 150 last year...that's more than a month's rent for my studio. It was time to concentrate on "money"...make book marks while thinking about how, exactly, I want to use the embellisher in the future. Meanwhile, I've been reading my book, Stitch, Dissolve, Distort. My mind is spinning with ideas but remembering a class I took once in Louisville, Kentucky under Valerie Campbell-Harding. One of the things that I learned during these four days was an approach to making art by first creating dozens of pieces of "complex cloth"...backgrounds (something I'm rather good at doing!) and then cutting and assembling these pieces to reflect the symbols, ideas, and images of a desired subject. I really identified with this approach. 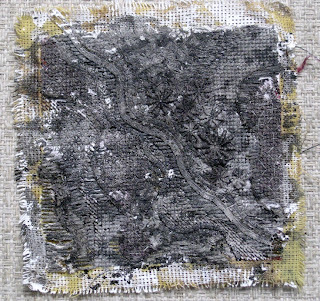 I've often "threatened" to take a month and make nothing more than stacks of "complex cloth"...backgrounds, experiments, ways of marking and manipulating material...foundations. As if I needed a little encouragement, something else happened...just yesterday. 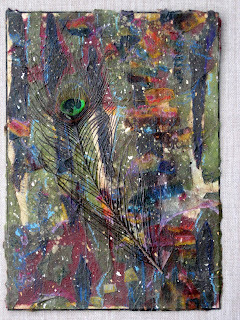 I read a post on the Altered Book Yahoo Group from a woman asking for suggestions about adhering a peacock feather to a journal cover. I've used peacock feathers and wrote to her with my suggestions. Then, in the studio...there were two peacock feathers sticking out of a brush container. They seemed to beg for use. 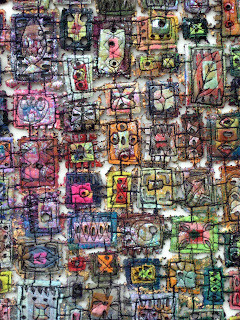 On the floor, leaning against a bunch of wooden boards were two ugly, incomplete collages on 8-ply mat board. Within a minute, the peacock feathers had a place. 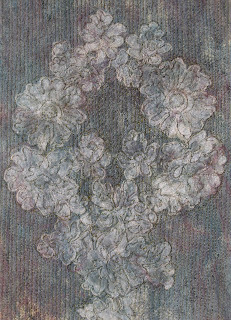 One needed something more....I came upon old acrylic transfers of daffodils. They were too ugly to be shown to anyone; but, torn, they were just the right touch. There in the pile of other papers was a Xylene transfered Xerox on a page from a mythology book (dated 1655!). It seemingly was begging to be used too...on one of the boards beside the collages. Pandore took about five minutes. Somehow...all this made sense. Somehow...all this related to the embellisher. My "empty" threat is now a promise. I've learned how to use the embellisher. I've discovered it's potential. 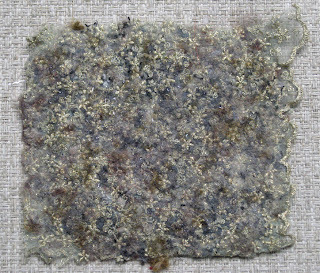 I'm not ready to create some grand masterpiece, but I'm quite ready to devote the next month (as soon as the last "In Box" for my exhibition is done...it's halfway there) to making "complex cloth" using the embellisher. While doing so, I'll think about what new series I want to create with this stash...maybe something based on the mosaics of Venice and Ravenna. 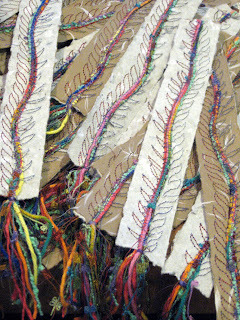 I'll bet that by the time I get a series planned and a pile of "backgrounds" stitched, the finished work will fall into place just like Pandore did...just like the peacock feathers salvaged poor collages. Whatever happens, the result will be uniquely my own...not a copy of someone's work with an embellisher. This will be time well spent...a workable plan, a journey, and a new body of art. The time I spent thinking about it was also useful...I got the book markers done, some scarves, and a few items to help pay for the rest. So, in addition to my promise to read my books: I will take the time to create work of deep meaning and originality. I will resist the temptation to "waste" time by playing and trying to retrieve projects that need to be set aside. (Their time will come!) I will do the work that pays the bills but not get caught up in the activity. I will remember the approaches and inspirations that really work for me and use them. I will "budget my time and money". Art and life can and will coexist in this delicate balance. Thank you, Mom, for the lesson. I'm still learning it. Thank you, Jacqueline, for reminding me to do so! I've been trying to figure out how to create a link for longer than it took to create a Flicker account, upload 26 images, and create a "collection". I've so admired other people's pictures on Flicker. Anyway, with any luck, I've done it. The LINK should take you to see transfers of digital photos of authentic African artifacts on pages from the book Black God. 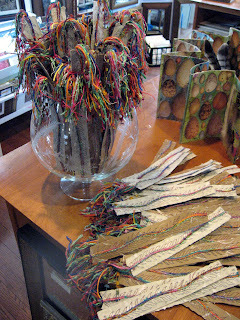 Each page was then hand beaded onto two pieces of handmade and/or decorative paper. Most are matted and shrink wrapped. Five are framed. I've got a bunch more of these to do...but they are fun and relaxing...especially in front of the television. Strata XI isn't like any of the others...except it is. What makes this a series is the fact that each is created on an adhesive, water soluble ground over which a clear piece of water soluble is placed. The other common denominator is the inspiration...the strata of the earth...like a cross section of ground found in geology and archeology textbooks. Okay, I haven't the slightest idea how geodes appear in nature...but this is the cross section of a whole bunch of them! Rocks were always fascinating to my sisters and I while we were growing up. We used to try gluing together strange Christmas ornaments from the prettiest pebbles found in a creek flowing off the Untersberg mountain outside Salzburg, Austria. My sister Wanda had a rock tumbler and still collects "minerals". There was a valuable rock collection in our garage...something my parents received from an older man once-upon-a-time. Geodes, of course, were like special treasures...a amethyst surprise inside an otherwise ordinary looking round stone. 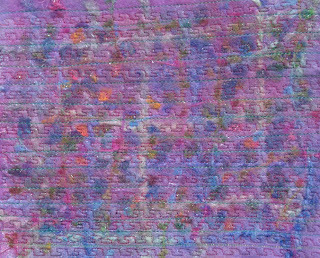 I created the piece using the headebo stitch...a stitch that has always reminded me of my Grandma Lenz and the pulls on her shades. All sorts of yarn was wound around paint containers, jars, and aerosol cans while I did the button-holing. Inside each, I put snips of sheer fabric and then free motion stitched. It was difficult...trying to navigate over the thicknesses. Next, I added French knots and the metallic threads by hand...and then I stitched by machine again. After I dissolved it, I didn't like the result. Something was wrong. A day later, a solution presented itself...my handy soldering iron. 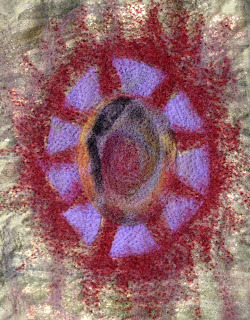 Once I melted away some of the sheers, there was a sense of a "void"...a "space"...just like a real geode. Now, I'm quite pleased with the piece. In fact, I'm thinking of doing another Strata, mostly in whites, with all sorts of gems scattered within the layers. The Strata Series has developed much like the In Box series did...a series of experiments on a theme. 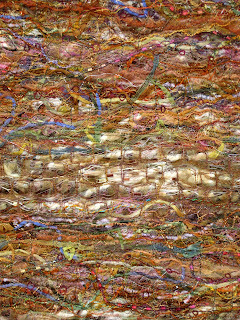 The approach to stitching has been the thing I've varied the most...sometimes trying to meander on a basically horizontal line, changing the color of thread in "tiers", trying a free motion repetitive design, creating "brick" or "stone" layers, blending into the background and contrasting with the background. Here, on Strata X, however, I think I've found the approach I like the best...it incorporates a little of all of the above. I basically "doodled" into the "strata"...trying to make the result look like the cross-section of the earth on which the series is based. Several weeks ago, I mentioned the idea of creating one of my In Box pieces and stitching it entirely with leaves. Well, here it is, In Box XXXVII. I used one of the interesting black chiffon scarves that has a gold metallic thread running through it. This is In Box XXXVI. Believe it or not, there are subtle differences in my In Box series...like the metallic foiling used and occasionally, I use a different cotton thread...though I prefer black. 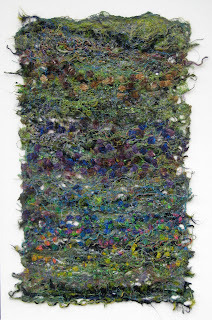 Since the start of the series, I've also used only black chiffon scarves or all navy blue...but recently I've been creating a torn patchwork of multi-colored, frayed chiffon. I love this effect. The photos really don't show the shifting color scheme, but it's there! This is In Box XXXV with a detail shot. I haven't forgotten the idea of creating a post with a step-by-step description of this process. I have actually taken all the pictures at this time. When this notion was suggested, however, I was nearly out of a wide assortment of chiffon scarves from Dale's fantastic, "Down Under" business, The Thread Studio. I simply can't live without chiffon scarves...and I couldn't finish an In Box until the order arrived. In a day or two, I'll post these images and explanations. Scroll down a bit...to a post from last week called "Tacky Inspiration". Gorgeous isn't it...hot pink, stretchy polyester velvet with a floral pattern. I knew I had to have it. Here it is, dressed up and ready to go Francis Marion University! My "five day weekend" was fantastic...and very, very productive! 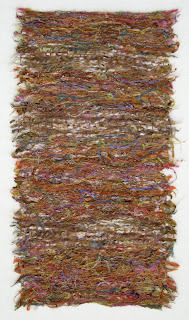 I am also only one piece shy of the sixteen I want for the solo exhibition at Francis Marion University. This is In Box XXXIII with a detail shot. 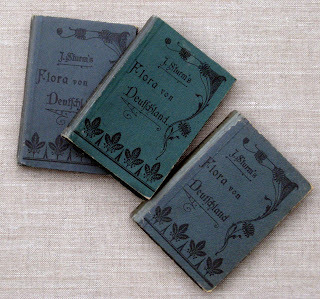 I solemnly promise to read my books! Blogging has been a wonderful experience. I've learned so many new techniques. Various posts have inspired me to create new work. 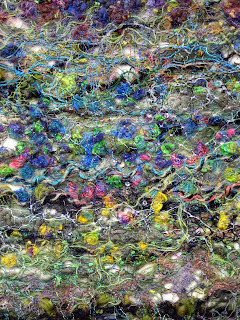 There is a sense of a global community of supportive, like-minded fiber enthusiasts. There is also "commitment". Once I've put an intention into writing on my blog, I feel a positive inner pressure to meet that self-imposed obligation. This is a GOOD thing. I must have looked through them in England at the Stitching and Knitting show when I bought them...they must have inspired me...I bought them. I haven't touched them since unpacking my suitcase from the trip. I guess...I'm inspired by the 'memory' of an idea...the imperfect recollection of a new approach." Well, Sue's question and my response kept me thinking all day yesterday. Somehow, more "puzzle pieces" came together. One of the author's, for example, had a familiar name...OF COURSE! I've been reading her new blog...totally excited about getting an insider's view to the upcoming Valerie Campbell-Harding retrospective! Well, the purchase of the two books started to come back to me...the Stitching and Knitting Show in Birmingham...Maggie Grey...a fantastic demonstration of water soluble paper...which I also bought and haven't use. I even took my son Mathias to the show on Sunday...an odd experience of walking around hundreds of eagerly shopping women with a gorgeous eighteen year old male ballet dancer...who immediately fell into a long conversation with Barbara Lee Smith about Merce Cunningham and contemporary dance. Mathias loved the water soluble paper. He thought it was the highlight of the show and encouraged me to buy it. He's been periodically been asking me about it ever since..."Have you used it yet?" My first step to this new goal...one which I'm publicly posting...was taken last night. I sat down and read Dale's Surface Tension...from cover to riveting cover. It was just in time. 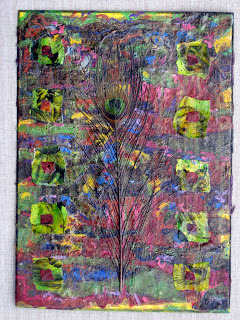 During the past five days I've finished the six pieces I started last week and created an In Box using my tacky material. Today, I open the box to the new embellisher...I'm armed with a swirling head of experimental ideas now! Photos are coming of the completed work...but today it is raining (Thank God! )...I take photos outdoors! Today was the second of five beautiful, creative, solitary days in my studio...working toward my solo exhibition at Francis Marion...finally stitching on operational sewing machines. So far, two In Box pieces and two Stratas are completed. My heart beats in a perfect rhythm. My breathing is easy. 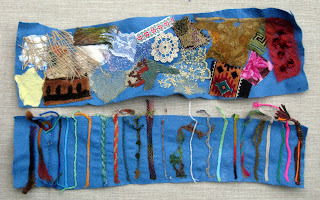 Images of art and possible new work lazily float through my imagination as I plan each section of free-motion embroidery. Days like yesterday and today spell "harmony". I've never been happier. There is total peace in my world. Relaxation is coupled with endeavorer. Quiet. Steady work. Busy hands and a happy heart. Choreography is a difficult art. Even professional dancers whose daily work involves making meaning from steps - often steps written by the great masters - can find the choreographic enigma elusive. And being a good dancer doesn't necessarily make it easier. The "dynamic" in the BRB's Dynamic Dance was evident in the brilliant pirouettes of Mathias Dingman and Joseph Caley and the scintillating jetes of Carol-Anne Millar but unfortunately less so in the new choreography. The brief article...a review of the entire program...went on. It didn't tear the evening to shreds but pointed to problems that even I noted. In the end, the final sentence was: "All things considered, I would rate this programme a success, a very necessary venture providing valuable opportunities to succeed and fail." So, this is the first mention of Mathias, as a professional dancer, in an international publication. It is positive. We are elated. Today I called Mr. Leichtner. Neither of my sewing machines were repaired. He actually blamed me for the situation. Frankly, he was rude and insulting. I was reduced to tears...facing a five day block of time without a working machine. He didn't have any free motion feet for the 220 either. In desperation, I called the new Bernina dealership in town, Creative Sewing. (www.creative-sewing-machine-center.com) They had feet for the 220. I went to get them...open toed and close toed. I was surprised at this shop. It is wonderful...and friendly and helpful and full of nice people eager to see interesting work and willing to embrace an embroiderer who doesn't just sew straight lines on pattern pieces. (This wasn't what I was lead to believe...but now I'm reconsidering the source of this information!) While there, I saw it...the EMBELLISHER! It really is a machine all into itself! Within a minute a new plan was devised: From now on, the 1630 (whenever it eventually gets repaired) will be used for its decorative stitches; the 220 is now going to be my new machine--free motion embroidery; the 1008 will remain the "back up" machine for when one of the others is in for repairs; the THE NEW EMBELLISHER will be for the embellishing I've been intrigued about for a year. Okay, I've got the attachments for this already on order from the shop in Sumter...so now, the 220 can "back up" the embellisher! Part of me thinks I must be crazy...what woman needs four sewing machine? Part of me knows the answer to that question...ME! Now, as planned, I'm facing five uninterrupted days in my studio with a working machine...actually three working machines...the 220, the embellisher, and the 1008...Mr. Leichtner called later to say that he didn't have time to service it but had repaired it...for $75...hopefully, this isn't a repair like the last one done to the 1630 which wasn't repaired and cost $125. Whatever...there's light at the end of this tunnel...Creative Sewing Center in West Columbia. They want me as a loyal customer and now I want them too! While getting the new machine, my mat boards got delivered and I spent part of this afternoon mounting the recently completed Strata VIII and Strata IX. These are for my solo exhibition at Francis Marion and are pictured here with detail shots...though all can be enlarged by clicking on them. Above: Strata VIII. Below Strata IX with a detail shot. I'm so excited! After working tomorrow, I'll be in the studio for five whole days. I can't remember ever having such a block of time to myself. I have work ready to go under the machine...and at least one machine WILL be working by then. I'm totally on schedule for the exhibition coming up at Francis Marion. Yet, I ran out of my favorite purple craft felt. This meant a trip to Hancock Fabrics. While there, I naturally picked up some interesting yarns and more 100% black cotton thread. Also, I always check the polyester stretch velvets. Amazingly, there were colors I didn't own. The sales ladies and I started talking about "tacky" fabric...how could we not? One of the "new" colors was a different shade of hot pink. We then found the most unbelievable tacky material I think I've ever seen. 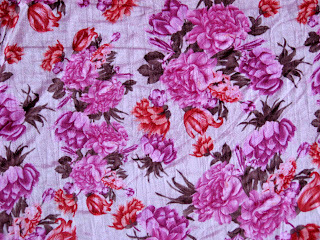 (It is pictured here...100% polyester stretch velvet with a pink floral pattern! Totally shocking!) Of course, I bought a yard and my head started spinning with ideas for a new "In Box" piece. 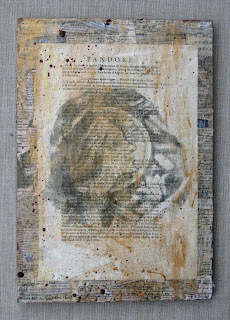 I can hardly wait to start it...another piece for the exhibit! I also shared my blog address with some of the ladies there. Now, I realize that my "In Box" series isn't on the first page of the blog. So, if you ladies are looking...click on May 2007. This is located at the right side of the page in the "archived" area. Scroll down. 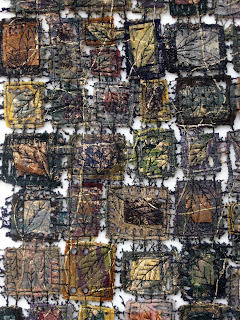 You will find some photos and also the images of the rusted fabric!